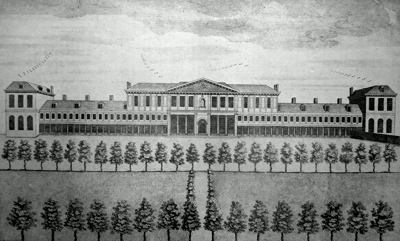 COLE, Benjamin, 1697?-1783 : [ASKE’S HOSPITAL] THE EAST PROSPECT OF HABERDASHERS ALMS HOUSES AT HOXTON. [London : 1772]. A handsome antique print – a prospect of Aske’s Hospital in Pitfield Street – (in more recent times the City and East London College). Engraved by Benjamin Cole and originally produced for the part-work edition of William Maitland’s “History of London” (London : 1753-1756) – with the present impression dated to 1772. Copper line engraving on paper. Engraved surface 236 x 365mm (approx. 9-3/8” x 14-5/8”). Paper a little toned with age, but still in very good and clean state. A guaranteed genuine antique print. Adams 38/075. 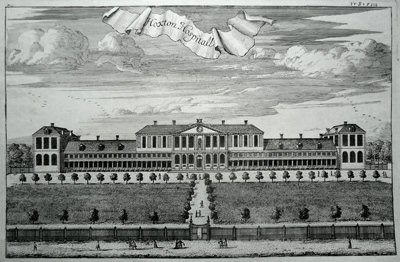 [KIP, Johannes, 1652-1722] : HOXTON HOSPITALL. [London : for A. Churchill, J. Knapton & others, 1720]. 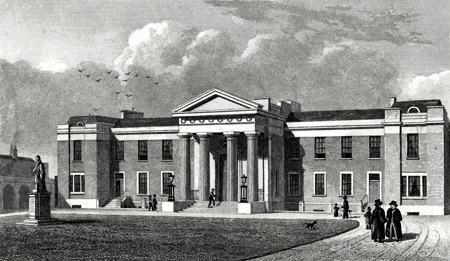 A fine eighteenth-century antique print – a perspective view of Hoxton Hospital (Aske’s Hospital in Pitfield Street – in more recent times the City and East London College). Originally produced to accompany the 1720 edition of John Stow’s “A Survey of the Cities of London and Westminster”, the engraving is generally ascribed to Johannes Kip, who engraved most of the other views in this series. Copper line engraving on laid paper. Engraved surface 209 x 326mm (approx. 8-1/4” x 12-3/4”). A clean and sharp impression in very good state. A guaranteed genuine antique print. Adams 25/015. SHEPHERD, Thomas Hosmer, 1793-1864 : [ASKE’S HOSPITAL] HABERDASHER’S ALMS HOUSES, HOXTON. London : Jones & Co., 1828. A handsome antique print – a view of Aske’s Hospital in Pitfield Street – (in more recent times the City and East London College) as rebuilt by D. R. Roper in 1825-1826. Engraved by John Rolph (1799-1862) from an original study by Thomas Hosmer Shepherd, the master recorder of nineteenth-century London. From Shepherd’s part-work series “Metropolitan Improvements; or London in the Nineteenth Century” (London : 1827-1830). Steel line engraving on paper. Engraved surface 92 x 150mm (approx. 3-5/8” x 5-7/8”). In very good and clean state. A guaranteed genuine antique print. Adams 154/050. SHEPHERD, Thomas Hosmer, 1793-1864 : ST. JOHN’S, HOXTON. London : Jones & Co., 1827. 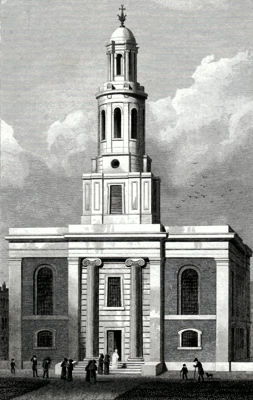 A charming antique print of the Hoxton parish church of St. John the Baptist, built by Francis Edwards in 1825-1826. 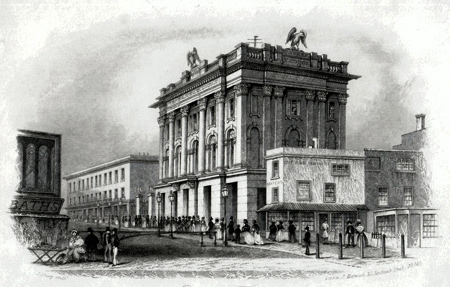 Engraved by Henry Winsor Bond (1804-1881) from an original study by Thomas Hosmer Shepherd, the master recorder of nineteenth-century London. From Shepherd’s series “Metropolitan Improvements; or London in the Nineteenth Century” (London : 1827-1830). Steel line engraving on paper. Engraved surface 151 x 92mm (approx. 6” x 3-5/8”). In very good and clean state. A guaranteed genuine antique print. Adams 154/028. SHURY, John, 1789-1854 : EAGLE TAVERN. CITY ROAD. London : J. Harwood, [ca.1845]. A handsome and interesting antique print – a vignette viewof the celebrated Eagle Tavern – the Eagle of the “Pop goes the Weasel” nursery rhyme, and the great London music-hall of the period. Drawn and engraved by John Shury for the London publisher John Harwood of Fenchurch Street. Steel line engraving on paper. Engraved surface 114 x 163mm (approx. 4-1/2” x 6-1/2”). A few faint marks and specks, but overall in very good and clean state. A guaranteed genuine antique print. SHURY, John, 1789-1854 : PLEASURE GROUNDS. EAGLE TAVERN. CITY ROAD. London : J. Harwood, [ca.1845]. 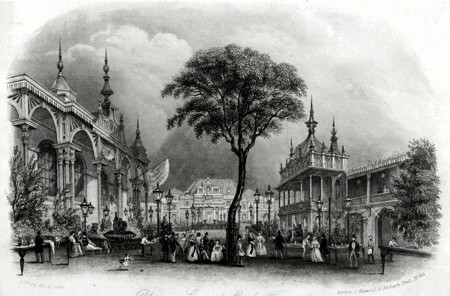 A fine and rare antique print – a vignette view of the gardens of the celebrated Eagle Tavern – the Eagle of the “Pop goes the Weasel” nursery rhyme, and the great London music-hall of the period. Drawn and engraved by John Shury for the London publisher John Harwood of Fenchurch Street. Steel line engraving on paper. Engraved surface 121 x 166mm (approx. 4-3/4” x 6-1/2”). Trimmed a little tight at head, a couple of faint marks, but overall in very good and clean state. A guaranteed genuine antique print. Return to North London Prints index page.